BTHR Solutions is exclusively dedicated to serving the HR community nationwide. We provide contract staffing, permanent recruiting and comprehensive HR consulting services. Click below to see how we use our HR expertise to make life easier for employers and job-seekers alike. BTHR BeneTemps specializes in providing experienced contract professionals at all levels to the Employee Benefits and Human Resources community. BTHR Recruiting places highly-qualified HR professionals in permanent positions at all levels in Human Resources and Employee Benefits departments nationwide. BTHR Consulting leverages our network of experienced professionals to deliver comprehensive Benefits & HR consulting and communications resources at highly competitive rates. We support all HR disciplines including HR Management, defined benefit, defined contribution, payroll, HRIS, health and welfare benefits, Workers’ Compensation, leave of absence administration and more. We constantly update our job board with the latest opportunities. You can apply online, refer a friend, or email your resume directly to resumes@BTHRSolutions.com. 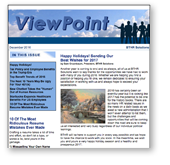 Viewpoint, our newsletter, delivers the latest news, notes and nonsense from the HR world. Find the latest HR news developments, hot job opportunities, and much more! Sign up for our newsletter by entering your email address in the box below or by contacting us directly at info@BTHRSolutions.com.